CONQUEST: the Race to Empire Begins! And thank you for all your kind comments on the post about my eleventh book, Victory. The twelfth book in the series is Conquest. 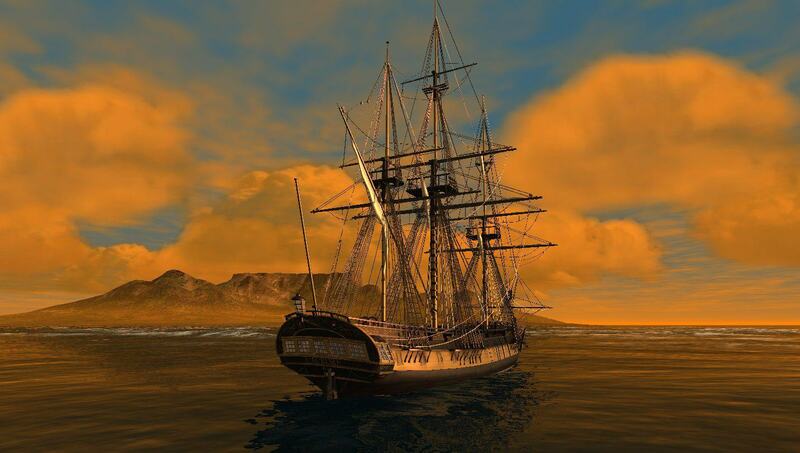 Victory at the Battle of Trafalgar removed the spectre of invasion and England was free to seek conquests and colonies in the furthest reaches of the world. Captain Kydd joins an expedition to take Dutch-held Cape Town, a strategic imperative to secure the rich trade-route to India. As usual, my research consisted of a meticulous study of documents, reference books, maps and charts, pilots – plus actual location research. After completing my preliminary reading and taking copious notes it was off to South Africa, where the book is set. Kathy and I based ourselves in Cape Town where first we undertook a number of days’ research at the excellent National Library of South Africa in Queen Victoria St and the Archives Repository in Roeland St. Several other smaller museums also yielded valuable material. Then, digital camera in hand, we explored the historical buildings of the city, many of which were there in Kydd’s day. 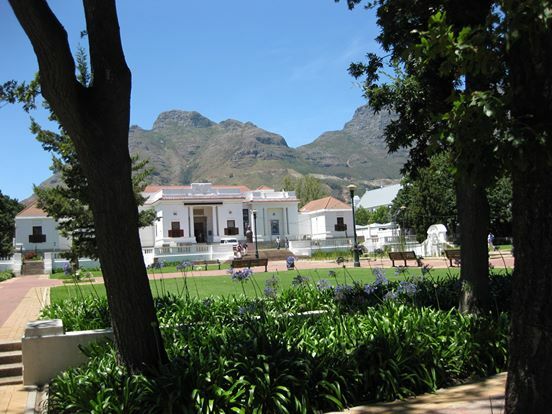 Among these: the Castle of Good Hope, built in the seventeenth century by the Dutch East India Company, and Government House in the very pleasant Company Gardens. After that, it was on into the hinterland. Our travels took us all around Cape Peninsula and to Simon’s Town, among other locations. Simon’s Town Museum proved another rich source of information. It is housed in a very picturesque building that was the winter residence for the Dutch East India Company Governor at the Cape. The setting of Cape Town must be one of the world’s most spectacular and we’d love to return sometime. Of course while we were there we also had to sample the delicious traditional cuisine – dishes such as bobotie, bredie and koeksisters, which are all mentioned in the book. Brown the onions and mince in a little oil, add the chutney, curry powder, tumeric and sugar. Season to taste then add the stock, apple and raisins. Simmer over a low heat for about one hour, adding a little water if needed. Place in oven-proof dish, stir in mashed bread, then add bay leaves. Pour the egg and milk mix on top and cook in moderate oven for 30 minutes. The top needs to be set and slightly browned on the sides. And also from Sybil is Granny Annie’s recipe for the Van de Hum liqueur that Renzi tasted. Lady Anne Barnard was a splendid chronicler of the times, warm and a shrewd observer both via the written word and through her skills as an artist. She lived at Cape Town for five years and wrote a remarkable series of letters and diaries – and also produced a number of sketches and watercolours. She was very much a ‘do-er’; I was not surprised to learn that she was the first white woman to climb Table Mountain! I was able to read her diaries and papers in the Cape Town Library/Archives and also view her paintings. The cover of this book is particularly striking and somewhat of a departure from previous covers. With the move of my previous editor to another publisher I gained a new editor at Hodder, Oliver Johnson, a hugely experienced publishing professional and a great fan of the genre. Oliver was keen for the cover of CONQUEST to reflect the new direction in the series post-Trafalgar and I’m delighted with the design Larry Rostant, one of the top cgi designers in the UK, came up with. How many authors can say they’ve been serenaded at a book signing? Thanks, Falmouth Shout! Among the special events that were organised to launch this book were a lecture at Pentillie Castle in Cornwall for Independent Booksellers Week and various book signings and talks. 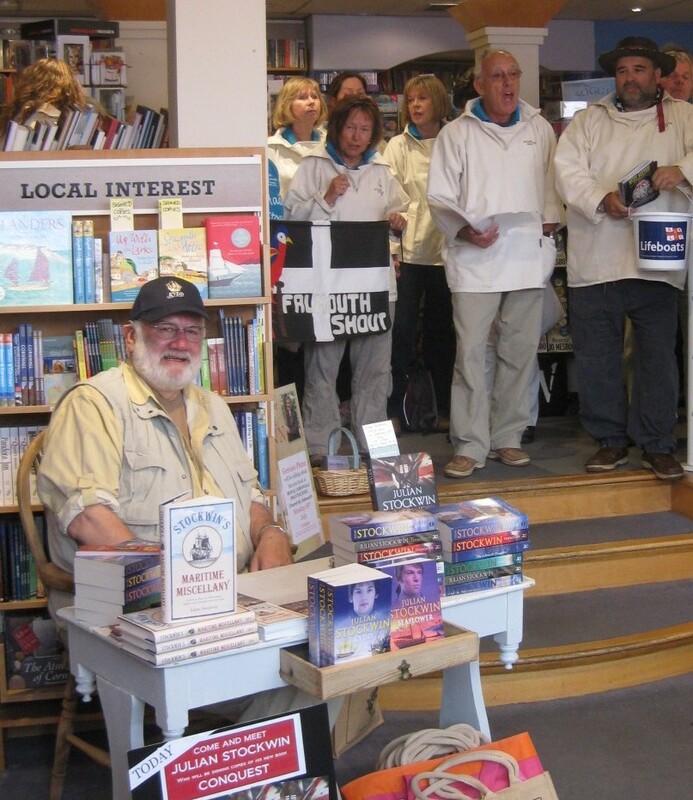 One signing I particularly enjoyed was held at Falmouth Booksellers where I was serenaded by Falmouth Shout, a wonderful group of Cornishmen (and women) who delight to quaff and sing shanties together. They also started the shanty festival in Falmouth and raise money for the Royal National Lifeboat Institution and other charities.